2 SHOWS: Saturday, November 11 @ 5:00 pm & Sunday, November 12 at 3:00 pm (DOORS WILL BE OPEN 30 min PRIOR TO EACH SHOW) please come on time! Doors will be locked as soon as shows start! Martikyan Music Center will be presenting “my jazz adventures” by an extraordinary and versatile pianist Tigran Martikyan. The program will feature original music as well as wide range of works from the Armenian and foreign composers. 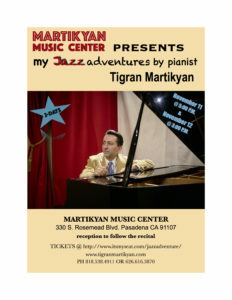 Martikyan Music Center is a intimate venue with a seating capacity of 21. Please make your reservations the head of time as seats will fill up fast! Coffee/beverages, cakes will be served after the show! Please fill in the following form to contact me.